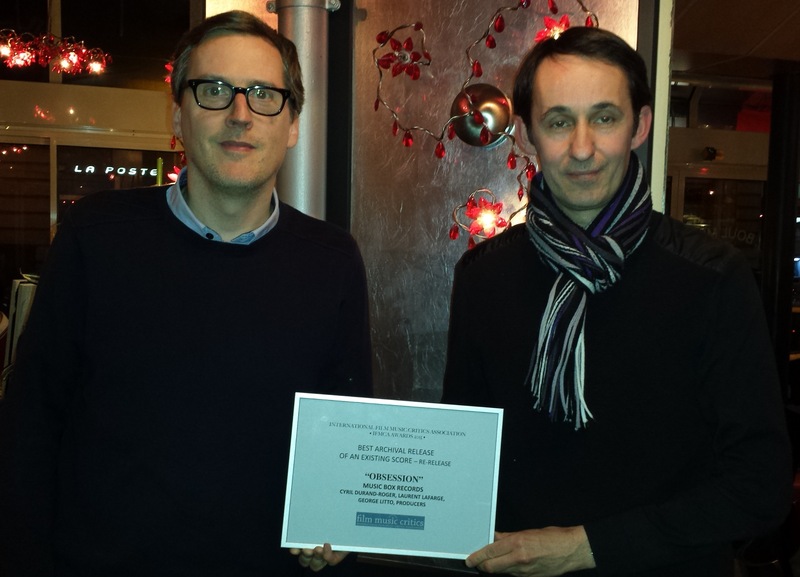 Laurent Lafarge and Cyril Durand-Roger, founders of Paris-based film music record label Music Box Records, have been presented with International Film Music Critics Association Award for Best New Archival Release – Re-Release of an Existing Score, by IFMCA member Florent Groult, for their exemplary work re-releasing Bernard Herrmann’s classic 1976 score for Obsession. They accepted the award on behalf of producer George Litto, liner note writer Daniel Schweiger, album art director David Marques, and restoration/mastering director Christophe Hénault. The other nominees in the category were new presentations of John Williams’s A.I. : Artificial Intelligence, James Horner’s Braveheart and John Barry’s Dances With Wolves, all three by La-La Land Records, and Intrada’s re-release of John Williams’ Jaws. Herrmann’s work for Brian de Palma’s psychological thriller was one of the composer’s very last efforts before his death, on December 24, 1975. In his overview about the Fathers of Film Music, IFMCA member Craig Lysy wrote that “Herrmann provided (with Obsession) what many believe to be his cinematic requiem. His score, which was infused with evocative choral beauty, focused and enhanced the film’s narrative of love haunted by death. Liturgical colors permeate the film from the opening frames and ultimately achieve a wondrous triumph during the film’s denouement. This score is enduring testimony to Herrmann’s mastery of his craft.” Music Box Records’ newly re-mastered release presents both the reconstructed and restored original film score from the best sources available to this day, and the re-mastered original 1976 soundtrack album, in a beautifully packaged 2-CD set. “It’s a true pleasure for me to present this very first IFMCA award to my friends Laurent Lafarge and Cyril Durand-Roger,” explained Groult, who has collaborated with them on some of their earlier releases. “Music Box Records celebrated its fifth anniversary last February, and they not could have dreamt about a better gift than this international recognition”. Click here for purchasing links for the album.